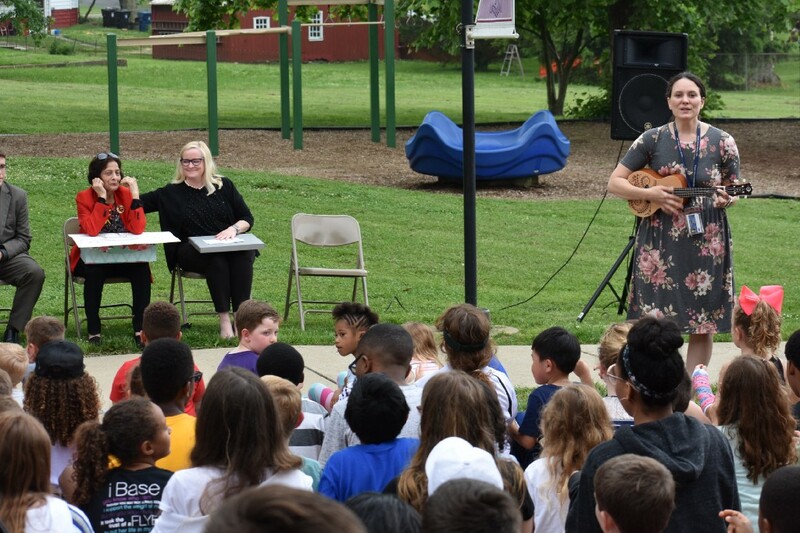 Music teacher Kate Hayden plays the guitar and leads Friends School Mullica Hill (FSMH) students in song to honor Hanshi Deshbandhu, a woman who celebrated 50 years of involvement with FSMH at the end of May. Teachers, community members and students past and present gathered behind the Hanshi Deshbandhu Building on May 31 to celebrate her involvement. Deshbandhu is former teacher, head of the middle school and now a trustee. 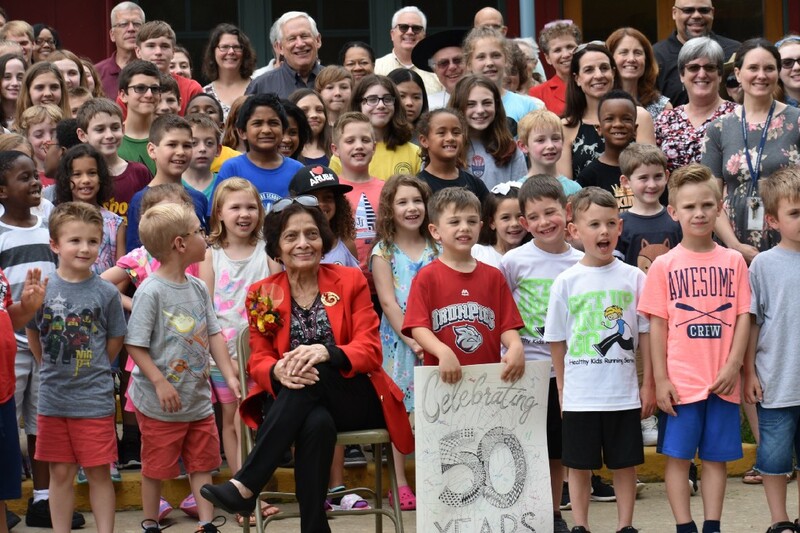 In late May, Friends School Mullica Hill ended classes early and welcomed community members and former students to sit and reflect on 50 years of dedication put forth by one woman, Hanshi Deshbandhu. Emigrating from India in 1967 with her husband, a Fulbright scholar, it was quickly discovered by many schools in Philadelphia and South Jersey that Deshbandhu had a mind able to impact the lives of many. Employed as a sixth-grade teacher in 1968 by the Friends School, at the time in Woodbury, Deshbandhu began a career that would call for her to play many roles. Teaching many classes, including English, Deshbandhu also assisted with the implementation of the middle school of which she eventually became associate head. In 2005, Deshbandhu became a trustee of FSMH, and she retired from teaching in 2008. Deshbandhu was celebrated for her innovative teaching techniques and the emphasis she placed on inclusion. She also believed in firsthand experiences as part of a fruitful education. Deshbandhu, on multiple occasions, took students to Europe. During another trip, Deshbandhu and her students visited the United Nations where they sang a song in Hindi to an Indian ambassador. On May 31, behind the building that bears her name — The Hanshi Deshbandhu Building — magic was the word of the day. Hanshi Deshbandhu seated with many FSMH students on the day of the celebration. The Hanshi Deshbandhu Building serves the first through eighth grades and the library at FSMH. At 86, Deshbandhu continues to serve on the board of trustees.